For a flight from Atlanta, GA to London England in July 2017, the cheapest fare is $1,460. But by playing with the dates and taking connections, I got the price down to $708. Changing the departure airport, in this case to from Atlanta to New York, the fare came down to $495. Ok, I can hear you now, how to get from Atlanta to New York? You can drive, take MegaBus, then my favorite the train, or you can fly. You have to decide if the additional savings are worth it. For my personal trip in July, I’m burning of a few frequent flyer miles on Southwest to get from Atlanta to New York. So, how do you find these airfares? Here’s what I do. Have an idea of where and when you want to travel. To start, use Kayak Explore. Key in your home airport and the time frame you want to take the trip in the month field. Then move the map to your area of your destination and click on the city you want to visit. On the right, click on find flights. Now you have a list of flights, you will notice the price has gone up! At the top of the page, click on the departure, arrival airports located in the top left. Check both boxes labeled include nearby airports. Next, click on show +- 3 days under the search button. Two additional boxes will appear. In both boxes, select 3 days before & after then click on search. In the Kayak search results, notably Kayak.com buy consensus in the very top left. It gives you an excellent idea if today is the day to buy, or if you should wait a little while. If you decide to wait a little while before buying an airline ticket, always create a price change alerts. Alternatively, you can download the Hopper app to your smartphone. This works well if flying internationally or your closest airport is a small regional airport. Go back to Kayak Explore but this time key in your destination airport in the home airport field. Now move the map back to where you can see airports that are within a day’s drive from home. If you see an airport that is much cheaper, then use that airport as your home airport and go back to steps one or two above. Tip: It’s a good idea to plan a little extra time when taking this approach in the case of any delays while in transit to your departure airport. Don’t just settle for your search results on Kayak.com, check other search aggregators for price comparisons. One in particular I like is Jetradar.com because they search discount carriers that aren’t listed on Kayak.com. I also like to check Skyscanner as well as they have a few search options that are different than Kayak.com’s. For example, in their map search is an option to show prices of direct flights only. 5. Look at online travel agent sites. 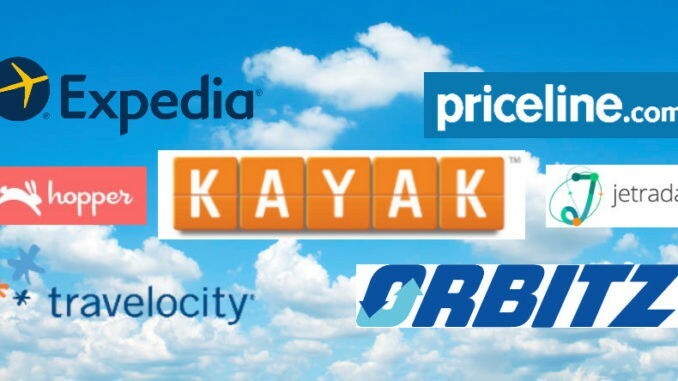 Now it’s time to take your Kayak.com results and look for the same flights on your favorite online travel agent sites. My preference is Orbitz.com who are exactly the same as Expedia.com. But also try travelocity.com and Priceline.com. Priceline.com is an excellent one to check since they have deals that other travel agent sites don’t have access too. 6. Check the price on the airline’s own website. Before buying a ticket, always check the price on the airline’s own websites. The savings, if any, won’t be much, but every dollar counts. It’s also an excellent opportunity to check the airline’s baggage fees and any other miscellaneous fees the airline may charge. As a final step before spending money on airfare, price up the discount carriers. Not all discount carriers pay commissions to other booking agents. Southwest Airlines is one of them, and that’s why you don’t see Southwest Airlines listed in Kayak.com’s search results. Check wikipedia.org for a worldwide list of discount passenger air carriers by country and region. It doesn’t matter if I’m traveling for business or pleasure, I always start at step number one above and work my way down. It is not always necessary to go through all of these search steps, but if you have the time, the extra effort can save you few extra dollars. Do you have any flight search tips you want to share with everyone? If so, please leave a comment here.